This plot shows how speed measured by GPS (red trace) differs from speed measured by a rear wheel speed sensor (blue). As expected, the error is magnified when the bike is leaned over, but note also the discrepancy under braking, where the rear wheel slows significantly compared to GPS speed. Velocity, as measured by a wheel speed sensor, is affected by several factors that must be taken into account when analyzing data. Speed and distance are both calculated from the rotational speed of the wheel (or countershaft) and take into account the circumference of the tire. This means that changing the tire to one with a different circumference will affect the speed data. For example, if you replace a tire that measures 2050mm in circumference with one that measures 1980mm (roughly equivalent to swapping from a 190/55 rear tire to a 180/55), your speed data will decrease by a factor of approximately 3.5 percent (2050/1980) – just as your speedometer would now read lower by the same factor. 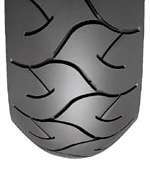 Now consider that because a motorcycle leans, the tire’s circumference is constantly changing. With more lean angle, the circumference becomes smaller and smaller, effectively raising the measured speed. Likewise, this affects the distance measured around a given lap. Additionally, tire spin and deformation has a similar effect. On a non-GPS-based system, these factors will distort not only the speed data, but all the data when looking at it over distance. When dealing with one rider on one motorcycle this is not much of an issue, as consistent laps will result in consistent data. However, comparing data from two bikes that have two different tire profiles will show some differences, or two different riders on the same bike will likewise create some discrepancy. Because GPS-based systems measure speed based on the motorcycle’s actual position on the earth, none of this is an issue and the data is somewhat more accurate and consistent. All that said, wheel speed is still measured in many cases and provides worthwhile data. As well, comparing speed as measured by GPS and wheel speed reveals some interesting data that can be quite useful.